I can’t decide if the sweater is more of an emerald color or maybe somewhere in a bluish pine region, but either way the color is gorgeous. This over sized turtleneck sweater is from H&M, and I love all of it. 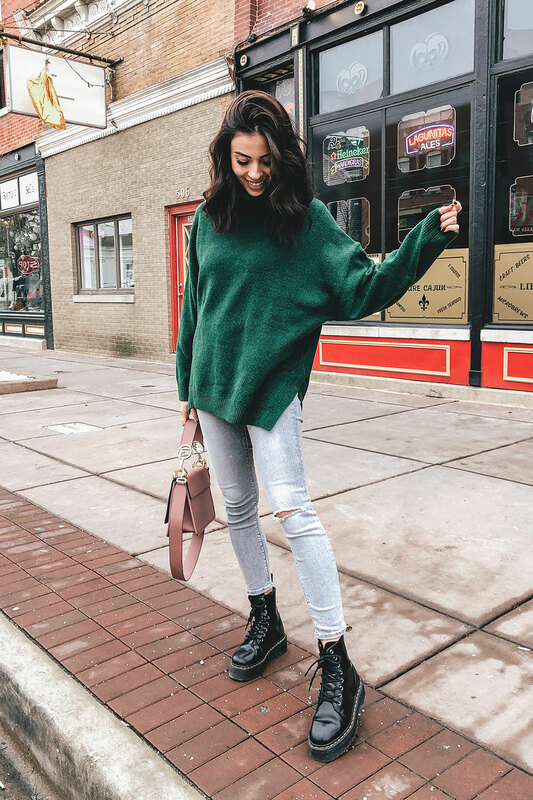 The long sleeves, the slits characteristics at the bottom of it, there are subtle things about this simple sweater that make it more than just an average over sized sweater. Often big sweaters like this are worn with leggings, which is understandable because those are crazy comfortable too. But I’m wearing these almost acid wash pants from Zara that have a small hole in one knee. They’re playful and fun, and work great under the big sweater. 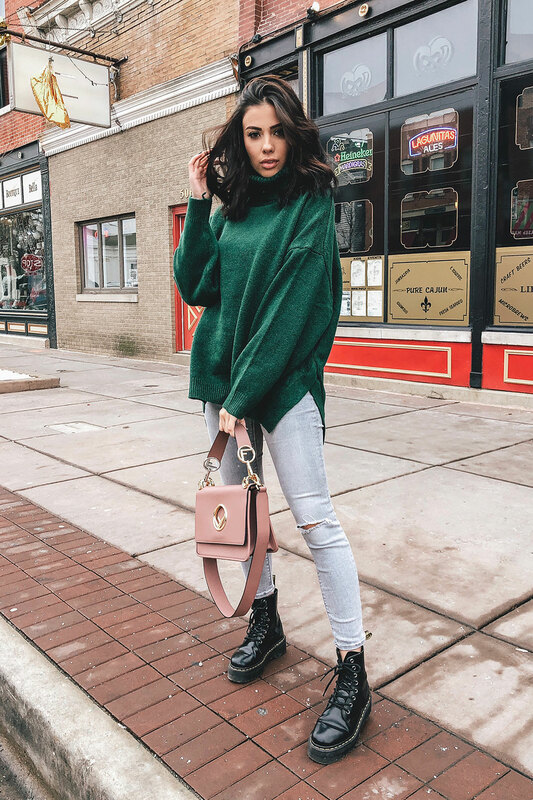 Since the sweater and jeans are sort of subtle items, it only makes sense to wear contrasting bold shoes and a bag. These Dr. Marteen boots give this look that pop of fun and adventure without being too extra. Same with the Fendi purse, it is a light pink color which actually compliments the green really well. Pink and green is often seen in shabby chic decor, so why not wear it! I could see even wearing a pair of white Keds or Vans with this look, or even a pair of black flats too. What do you think? 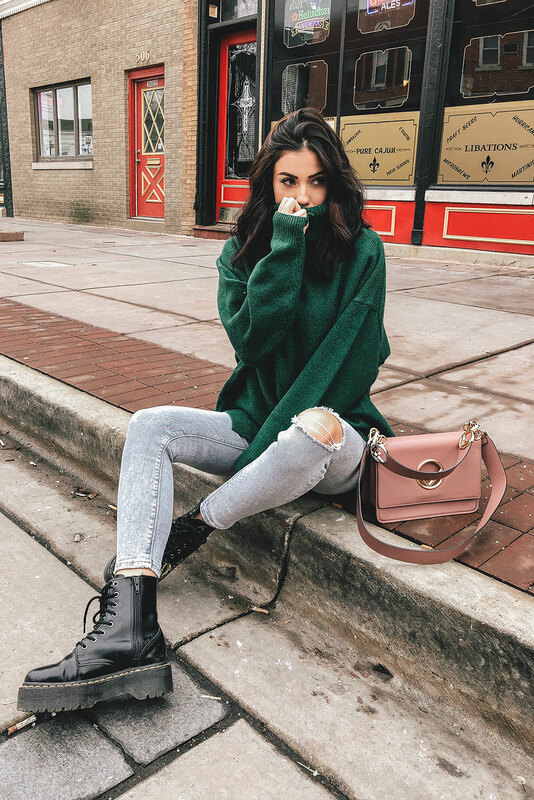 Tell me in the comment section at the bottom of the page what you think of this Green Sweater Outfit!